IT’S FOOTBALL SEASON!!!!! Can you believe it??? How did Fall sneak up so fast? And real Fall – not even just September 22nd type Fall, but full on FALL! We are officially in November people! How did this happen? Why am I so excited that it’s football season? Well, duh Haley – probably because you like football. Ehh, sort of… it’s okay. What I really LOVE though is getting together with good friends, eating amazing food, and if the game so happens to be on in the background – that’s cool! You can find me by the snack table. Favorite game day food? Well there are just SO many – but the answer is easy really. Game day Chili is the BEST. There is seriously nothing better than a warm bowl of chili when its cold outside. 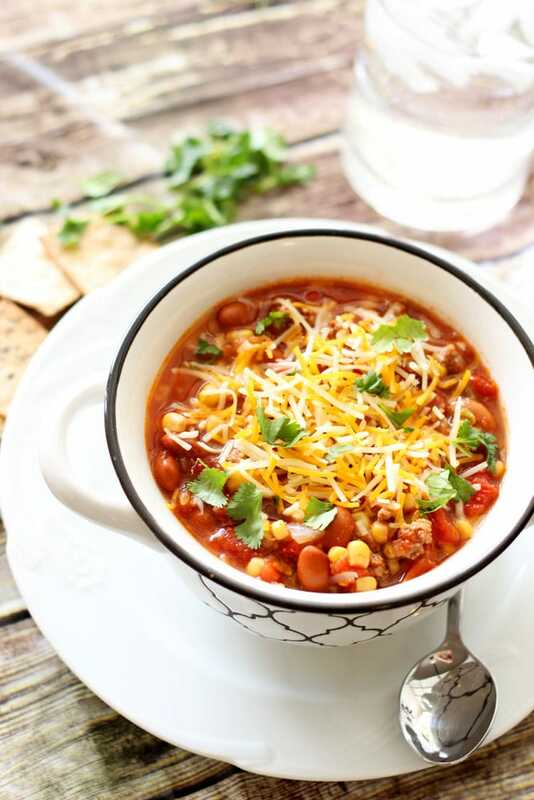 Chili is so comforting – packed with flavor and protein, not to mention it is an excuse to eat bread, cornbread, and/or tortilla chips (yes I said AND/or… I will happily accept all three options with my chili!). But how does one even keep track of all the AMAZING different types of chili out there?? Obviously, there is the standard, all-beef, tomato-based chili – jam packed with kidney beans and chili powder. But let’s not forget about all the other incredible chili types out there – turkey, chicken, sweet potato, pumpkin, lentil, black bean, mexican spice, chipotle, and quinoa – the list goes on! I decided it was time to a nice a create a nice little round up of my FAVORITE Game Day Chili recipes – because why not? This Game Day Chili roundup features all kinds of chili! I don’t care who you are – healthnut, foodie, carnivore, herbivore – you can find the perfect chili for your next game day on this list. Or maybe you hate football – who cares! You can still enjoy these easy to cook recipes any night of the week! In this post, you will find 15 FABULOUS recipes, arranged by the type of meat which is featured in the recipe (turkey, beef, chicken, or meatless/vegetarian/vegan). Thank you to all the incredible bloggers who made this post so easy to compile – yet so hard to narrow down. There are just so many unique. Let’s get cooking! This game day chili is jam packed with taste and texture. The turkey is light yet flavorful – browned with cumin, chili powder, cayenne, onion, and garlic! 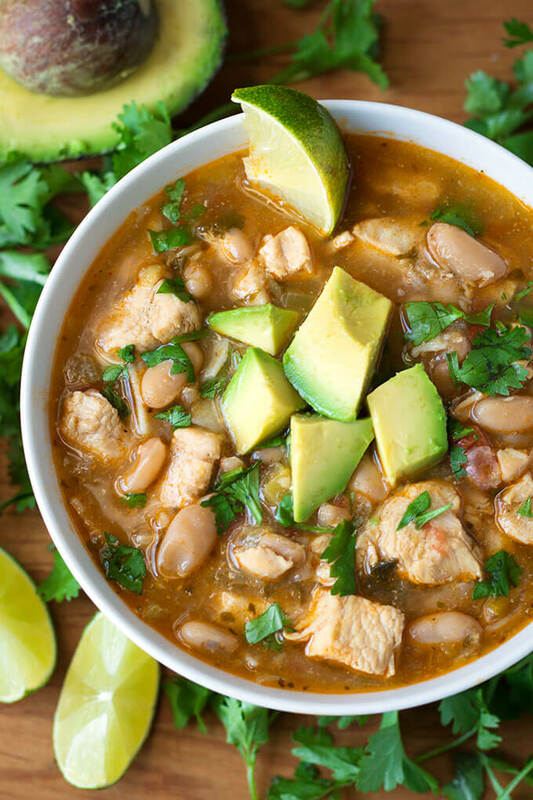 Surrounded by a rich, warm and flavorful white broth that is slightly creamy – every bite rich with white beans, hominy, green peppers, and of course – bacon! MMM BACON! Oh and don’t forget the kick of spice! Those jalapenos add just the perfect amount of flavor and kick – so even a mild eater will not be able to resist. Even better? The recipe is super easy because you can just throw all the ingredients into a crockpot! A few hours later – voile! Delicious chili that everyone will love! 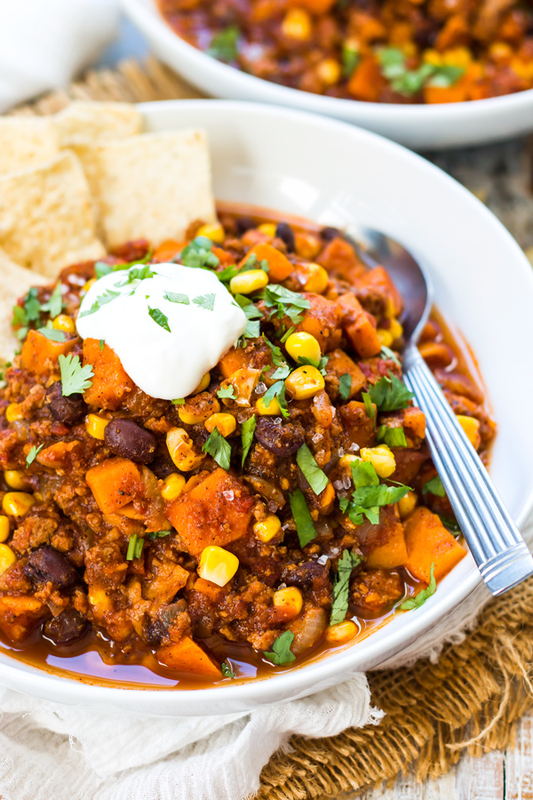 Loaded with nutrition and full of flavor, this sweet potato ground turkey chili is a win-win for the cold-weather seasons. Sweet potatoes are chock-full of Vitamin A and good bit of Vitamin C, too. The turkey makes this dish full of lean protein, without the fat of ground beef. Paprika and cinnamon are two spices that make this chili uniquely delicious. Thank you, London at Evolving Table for an incredibly awesome healthy chili recipe that I cannot wait to make again! HOW FUN IS THIS?? I love chili. I love cornbread. So why not combine the two into one?! What makes this recipe unique? 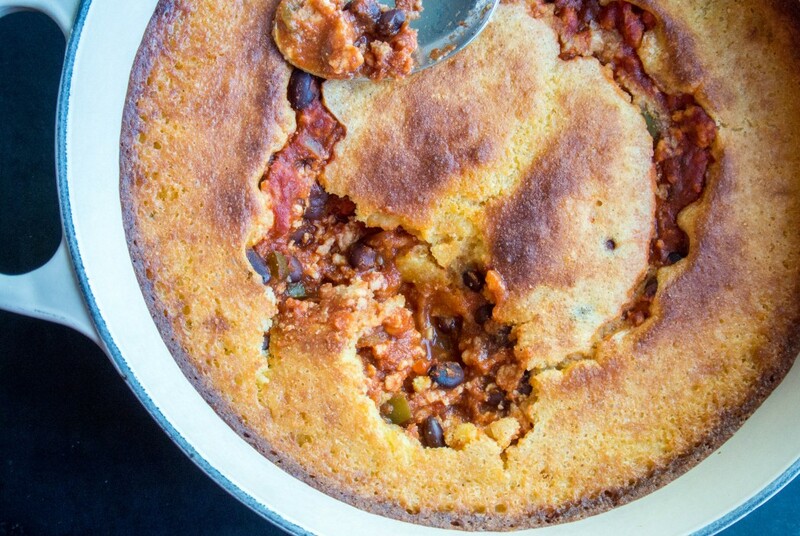 Well besides the fact that there is cornbread backed right on top of the chili (amazing), this recipe uses a can of salsa and a jar of tomato sauce – making it even easier to throw together at the last minute. There are only seven ingredients in total! SEVEN! Well… cornbread is not technically a single ingredient – but there are super easy, and delicious boxed mixes for cornbread. I love Jiffy Corn Muffin Mix and Krusteaz Honey Cornbread , but heck – there are even gluten free cornbread mixes available these days! This recipe is one to keep! 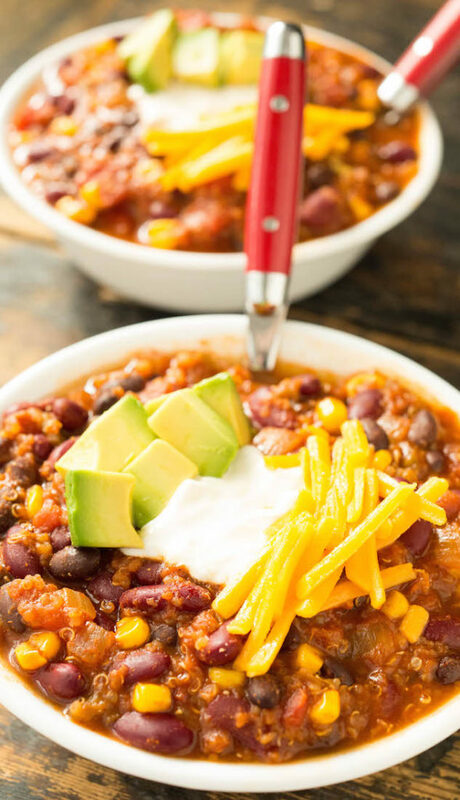 As Justine, the brain behind Dinner Geeks, mentions in her post on this slow-cooker chili – everyone has different chili tastes! Many of us come from families where a parent made the BEST chili. But what happens when you marry someone – and his/her parent made the BEST chili. Suddenly – chaos! This set-it-and-forget-it game day chili is jam-packed with fresh vegetables, chunky tomatoes, three types of beans, and tons of warm herbs and spices. 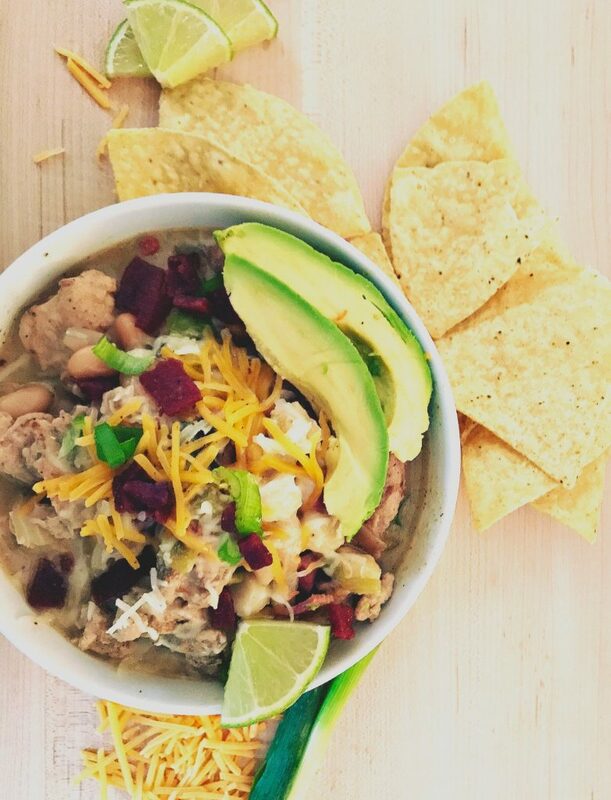 This Southwest Stew recipe promises to be easy because you make it in a crockpot! Full of zesty tomatoes, corn, beans, and beef – every bite of this stew promises to be just as flavorful as the last! With just enough spice, this stew pairs perfectly with your favorite cracker or a slice of fresh baked cornbread! This recipe by Fork in the Kitchen emphasizes all the traditional chili flavors that you know and love – cumin, chili powder, and cayenne pepper. The surprise twist? Tomato soup! 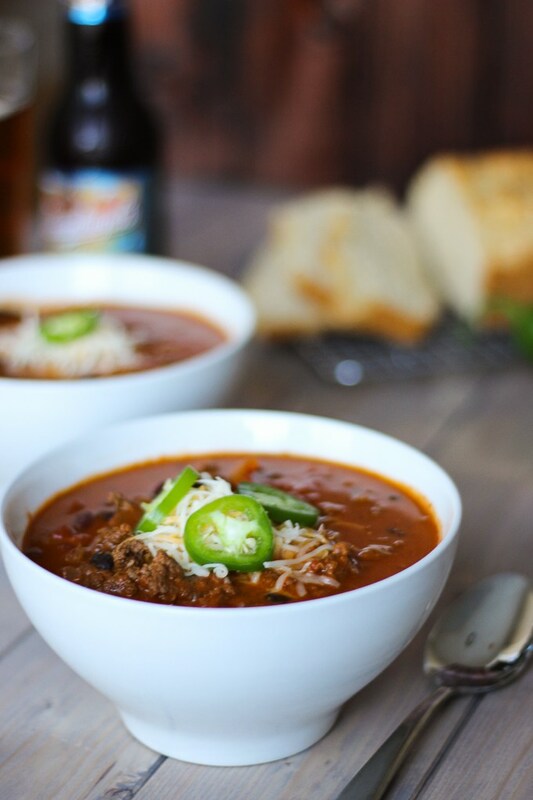 I had never heard of putting tomato soup in chili, but what a great idea! Tomato soup is already delicious on its own, so why not take advantage of something already great by making it better – and making your life a little easier? I also love that this recipe gives an option for vegetarians. Skip the meat and add an extra can of beans! Or, brown some beef on the side for meat-eaters to enjoy and leave the pot meatless for the vegetarians in your family! Who doesn’t love a good one pot recipe? I definitely do – sometimes I think I push the limit when it comes to lazy cooking. Adding everything into one pot and just hoping it turns out well. But with soup and chili, you really can’t go wrong! One pot allows all the flavors to swirl together and create a symphony of deliciousness. I love the looks of this chili by Pass Me Some Tasty because although it does have meat, it embodies so much additional, fun flavors! Butternut squash, red pepper, black beans AND pinto beans, fire-roasted tomatoes – you almost don’t even need the meat! In fact, this chili can easily be made vegan by omitting the meat! 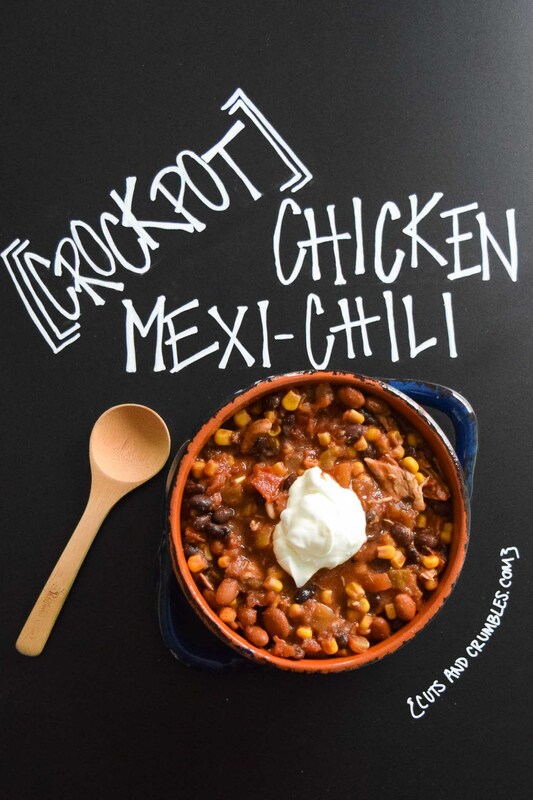 This Crockpot Chicken Mexi-Chili by Cuts and Crumbles looks DELISH! But really – who am I kidding, I will use any excuse to put tortilla chips in my chili. I love the idea of using taco seasoning to really emphasize the mexi-flavor in this awesome chili. This recipe is the epitome of an easy crockpot recipe. The first two instruction lines – “Add all ingredients into the crockpot and mix well… Cook…” Uh, yes please! Chicken, black beans, pinto beans, tomatoes, and green chilis – cumin, chili powder and taco seasoning – YUMMY! This chili would be perfect to make on Sunday and eat throughout the week with different fun Mexi-inspired dishes – quesadillas and nachos come to mind immediately! There are two types of white chicken chili out there, creamy and not creamy. Both can be equally delicious – and neither should be overlooked. This chili does not use cream and therefore is lighter in texture but definitely not in flavor! What makes this chili recipe unique? In addition to some of the more traditional chili spices (cumin and chili powder), this instant pot recipe uses green chilis, salsa verde, cilantro, oregano, coriander, and lime juice to pack each bite with a punch of flavor. This chili is the perfect vehicle for all the other delicious toppings that I NEED in my life – cheese, avocado, sour cream, tortilla chips. Oh. Em. Gee. What have we found here – the ULTIMATE FALL RECIPE? Pumpkin and chili combined into ONE MEAL? I can hardly contain myself. This comforting bowl of chili is flavored with not one, but two different peppers (jalapeno and poblano), a can of pumpkin puree, and a creamy texture everyone will love! Using an ingredient like pumpkin to create a savory recipe can be very challenging, but when successful – the result is incredible. I cannot WAIT to try this savory pumpkin chili for myself as soon as possible. Even better? Paleo and Whole30 variations also included. 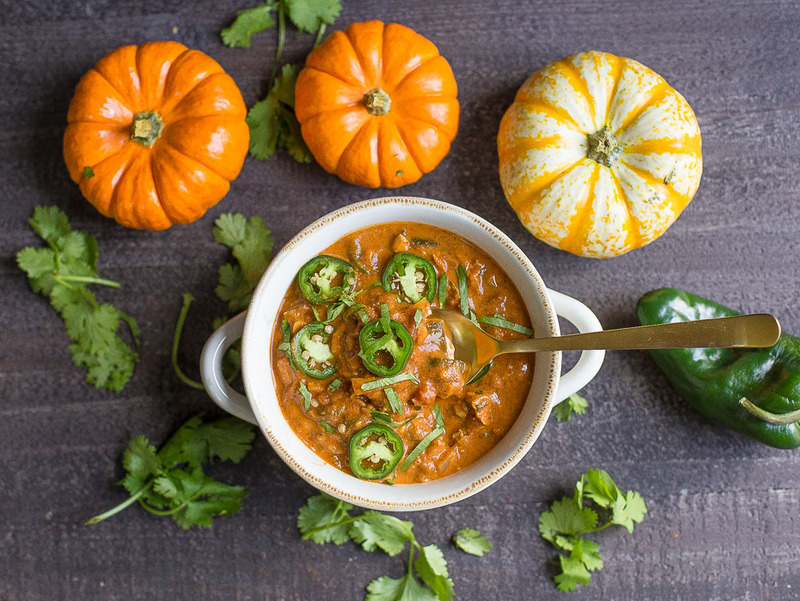 I cannot WAIT to try this savory pumpkin chili. Amy at Wholesomelicious has truly outdone herself with this one! Remember how I mentioned that there are two types of white chicken chili? Well here we have our SECOND type! 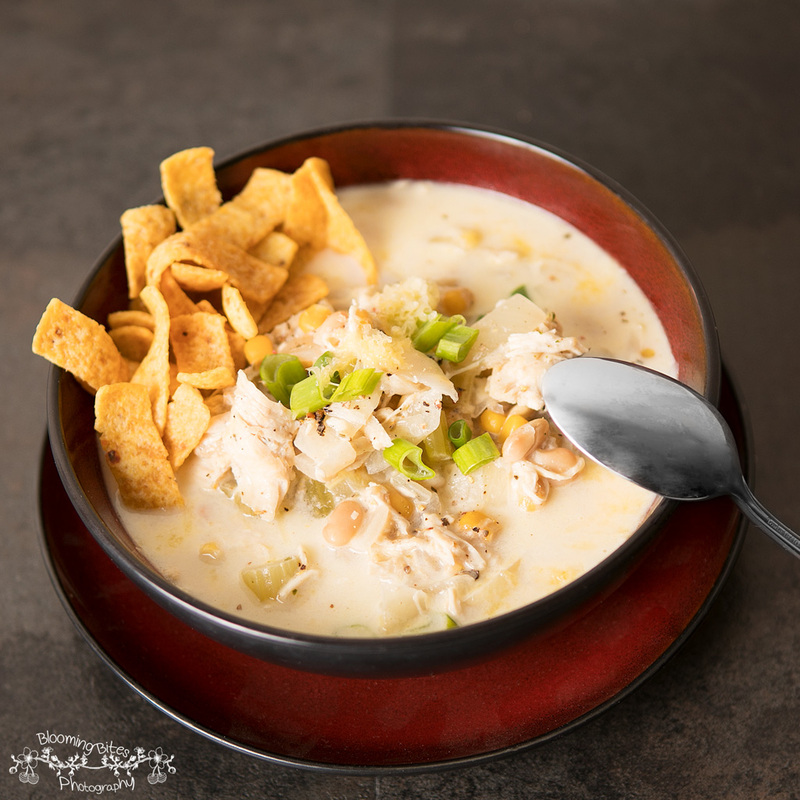 The creamy, delicious white chicken chili that you dream about during cold winter nights. 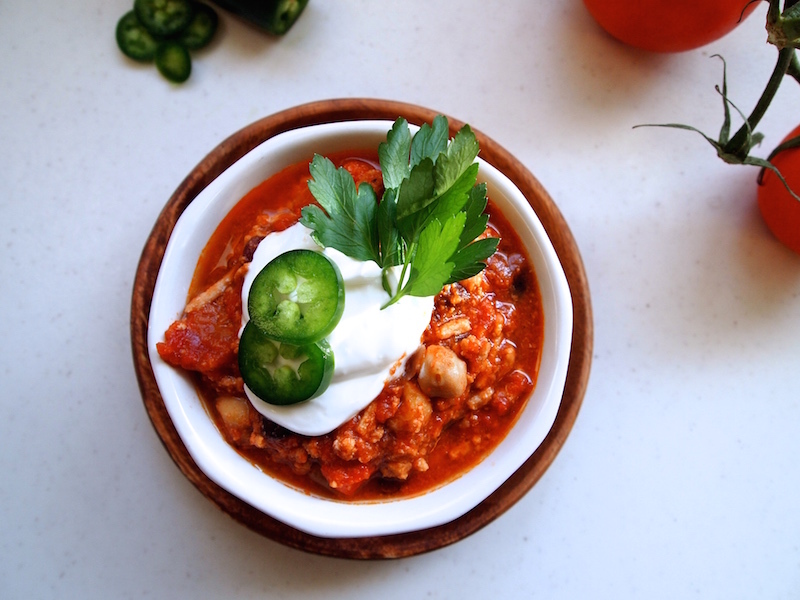 This chili by Blooming Bites contains corn, white beans, ground white pepper, oregano, and heavy cream for that rich, full-belly flavor. Recommended toppings for this chili? Of course we have the typical cheese, green onions and pepper – but my favorite recommandation – FRITOS! Don’t mind if I do. 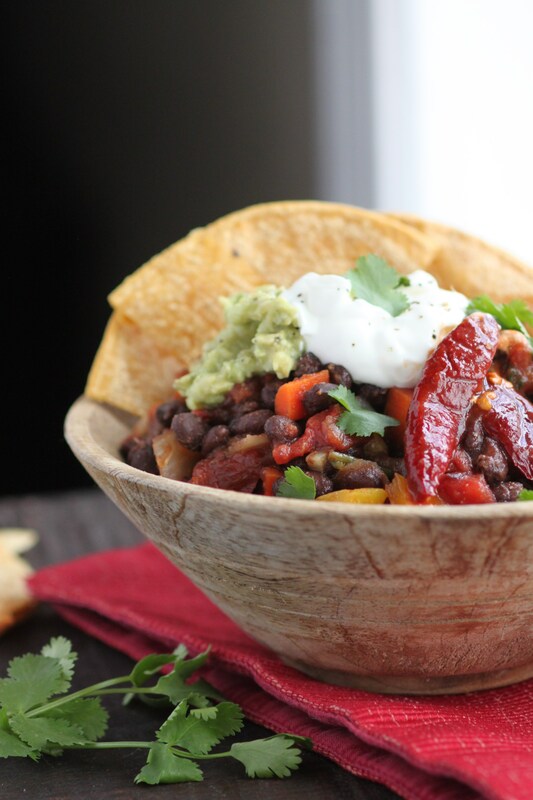 Important health warning from Blume Nutrition: This black bean chipotle chili may kick start your metabolism, balance blood sugar levels, reduce cravings, and destroy bad cholesterol! This beautiful vegan chili uses fresh bell peppers, carrots, kidney beans, black beans, spinach, and canned chipotle peppers to build a fire of flavor in your belly. 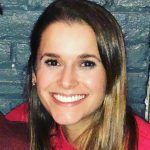 Sebrena from Blume Nutrition does a beautiful job explaining all the amazing benefits that chipotle peppers have to offer. So many of which I did not even know! This lentil bean chili is easy to prepare vegetarian, vegan, and gluten free. So many chilis use a base of meat, black or kidney beans – I love that this recipe spotlights a new and different type of legume! The lentil bean. 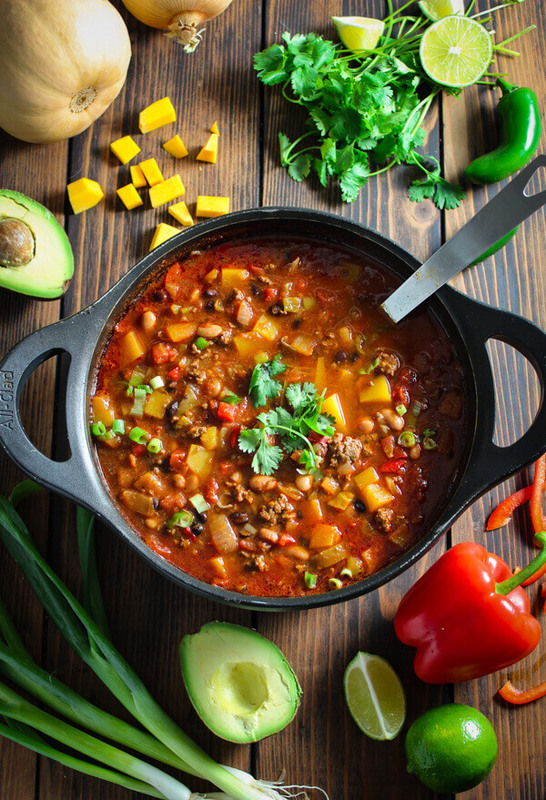 Garlic, tomato paste, green bell pepper, oregano and basil are some of the original flavors that make this lentil bean chili so delicious and unique. And best of all, no overnight soak for those lentil beans is required! This Vegan Sweet Potato Chili with Black Beans and Quinoa will stand up to the strongest scrutiny. It brings smokiness of ancho chili powder, the richness of roasted vegetables, the protein of quinoa and the sweetness of sweet potatoes. The veggies (corn, sweet bell pepper and jalapenos) are roasted and added to fire roasted tomatoes. This chili recipe is one that even meat-lovers will find hearty and delicious. Being nutritious as well is just a plus! 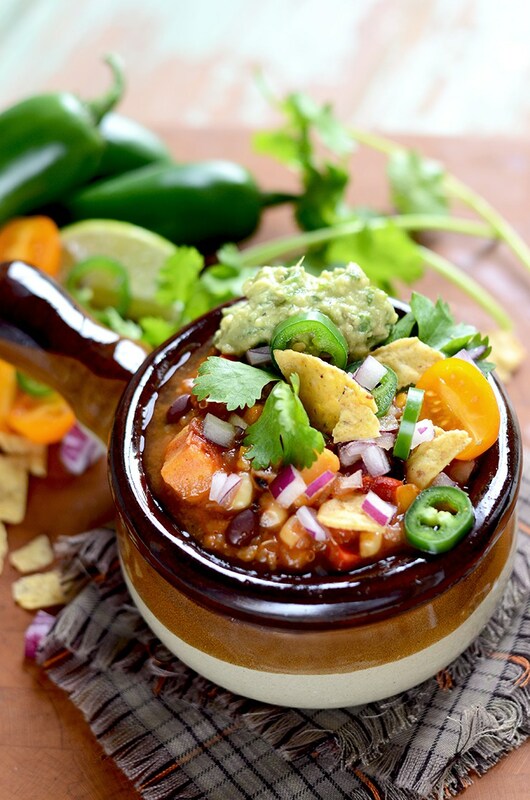 Another great vegetarian recipe, this Meatless Quinoa Chili recipe by Cooking with Janica will seriously fill you up. What makes it so unique? Surprise ingredients like cocoa powder, paprika, sugar, and coriander – who knew chocolate and chili would make such a winning combination! And there you have it – 15 amazingly delicious, yet different, Game Day Chili recipes for this coming game day, Netflix binge watching session, or family dinner. Try one, try them all! But most of all – enjoy!! 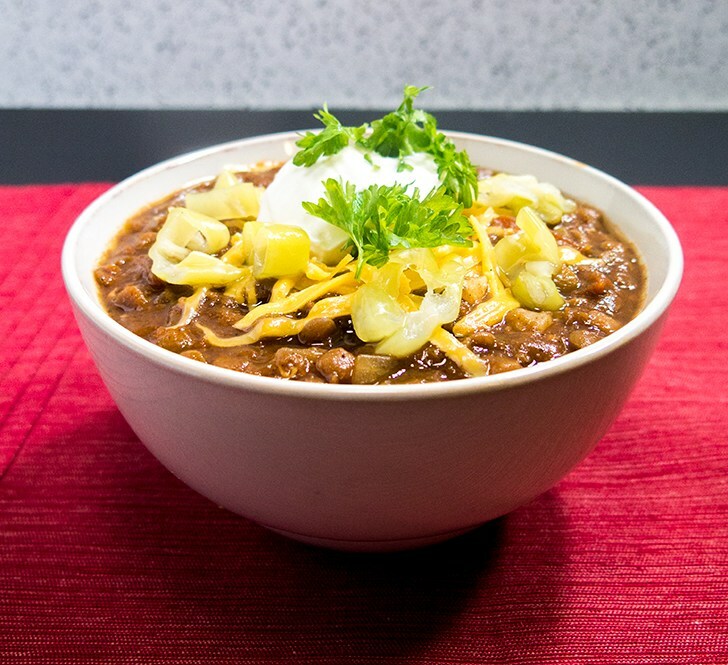 Do you have any favorite Game Day Chili recipes? Share them here!